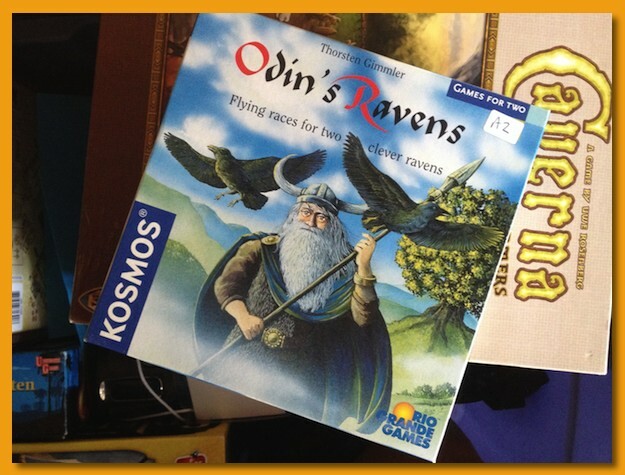 About five years ago I ran across one of the Kosmos two-player games called Odin’s Ravens and was intrigued by its high rank and passionate following. 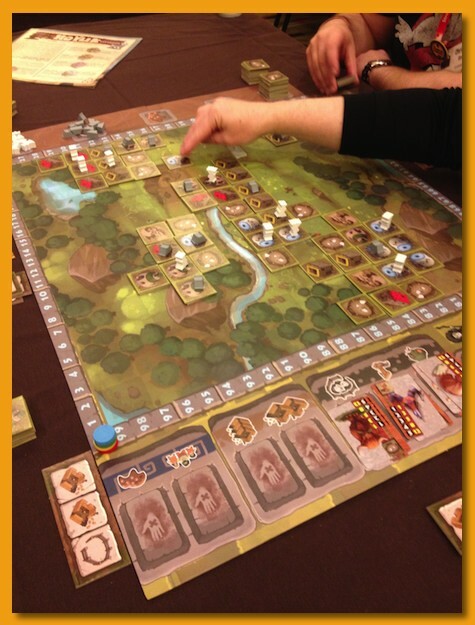 At 6.7 on BGG, it seemed like a solid game worth tracking down. 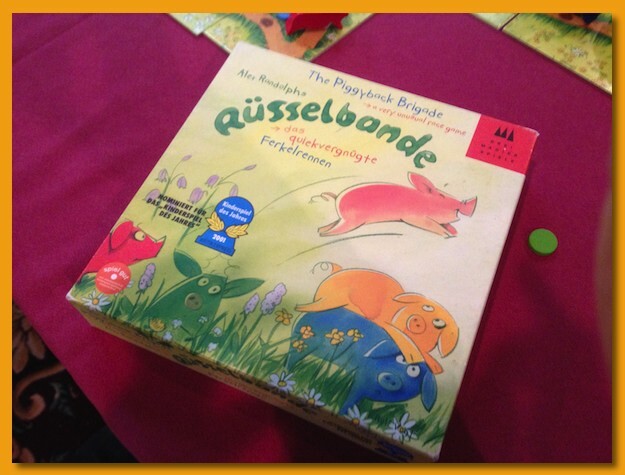 I’m always looking for strong two-player games so I started looking but had trouble finding a copy. Published in 2002 by Thorsten Gimmler, there just weren’t that many copies available and those that were out there were being held onto strongly. I’d never obtained a copy but still had it on my wantlist. The prices started rising and I figured I’d not see a copy any time soon. 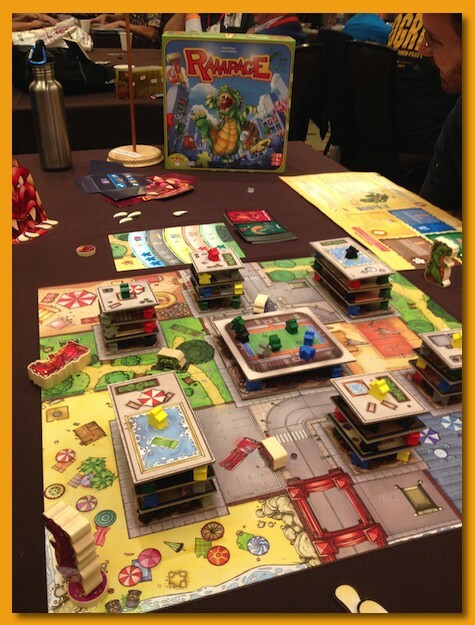 Fast-forward to Great Lakes Games earlier this month and when my name was called a second time for the prize table, there was a nearly pristine copy sitting there and I rushed the table and grabbed it. Prices are all over the map from $40-$150 for a copy but I wanted it to play! 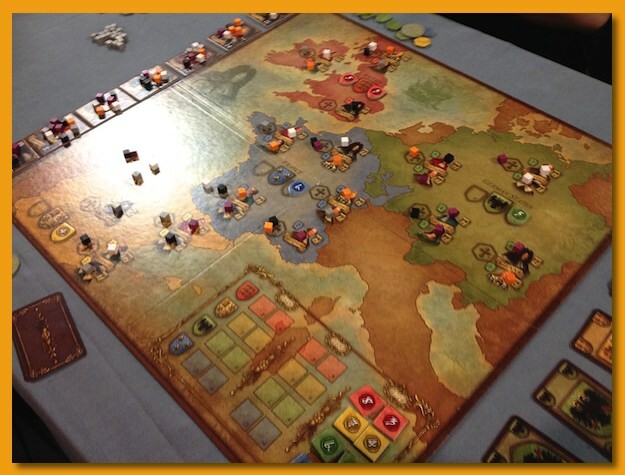 This weekend Lisa and I opened it up and played several games and I have to admit, it lives up to its rating. The game is light enough that you can talk and sip tea while playing but there’s enough strategic and tactical options available to keep gamers engaged. 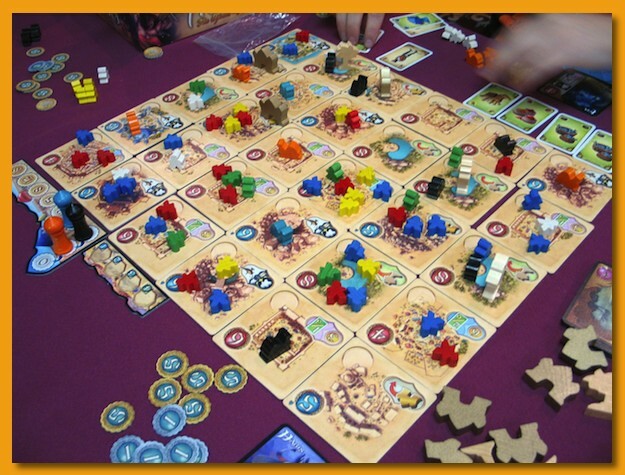 The game is composed of several mini-games (races) ending when one player reaches at least 12 points. 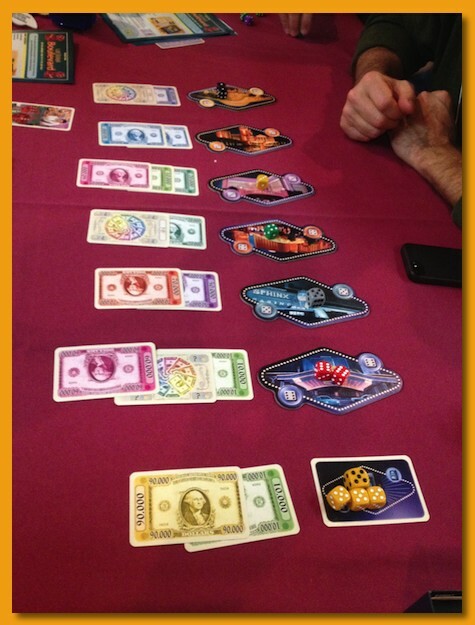 Each race is a complete mini-game and only the points are carried forward to the next race. 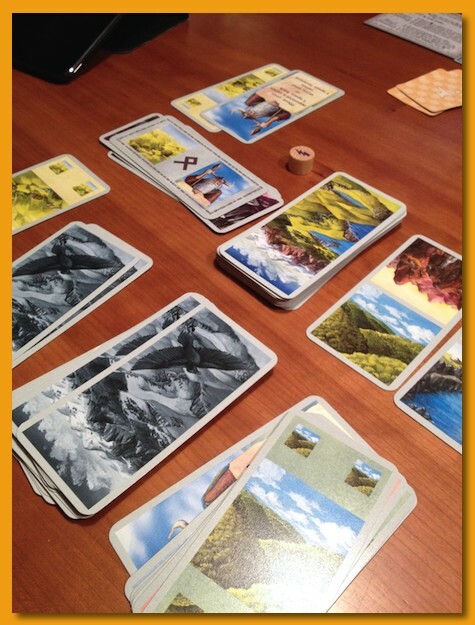 At the begin of each race, nine landscape cards are dealt out in a line establishing the terrains over which players will attempt to advance their ravens. 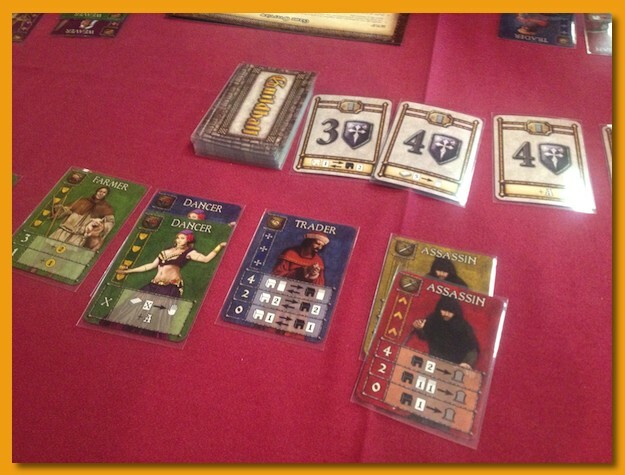 Each player has a hand or five cards drawn from a personal deck (each player starts with the same cards in their deck). 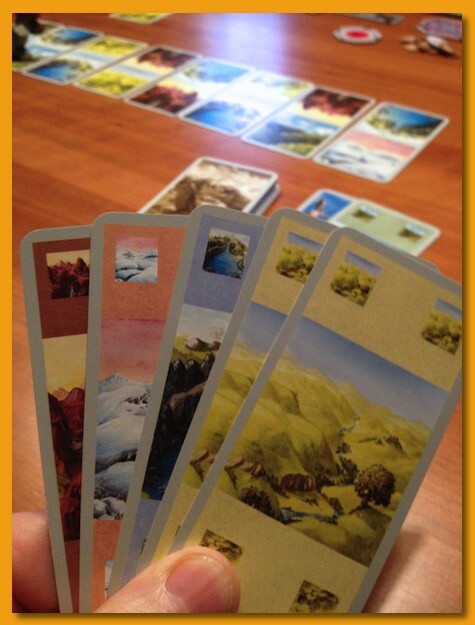 Each card depicts a single terrain type and players attempt to play cards from their hand and from an auxiliary deck (built from previous turns). Terrain cards that match the terrain card in front of their raven, advance the raven. 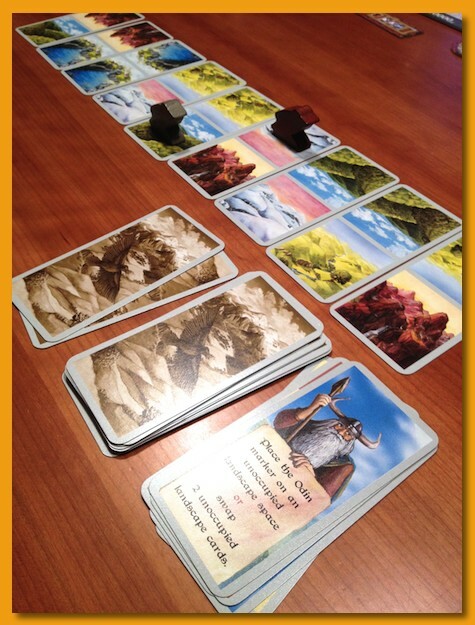 The personal deck also contains Odin cards which have some rule-breaker text on them that allows players to swap terrain tiles, rotate them, move ravens forward or back, or otherwise mess with the other player. Players also, during the race, have a chance to extend the length of the race by adding cards to the end of the track. 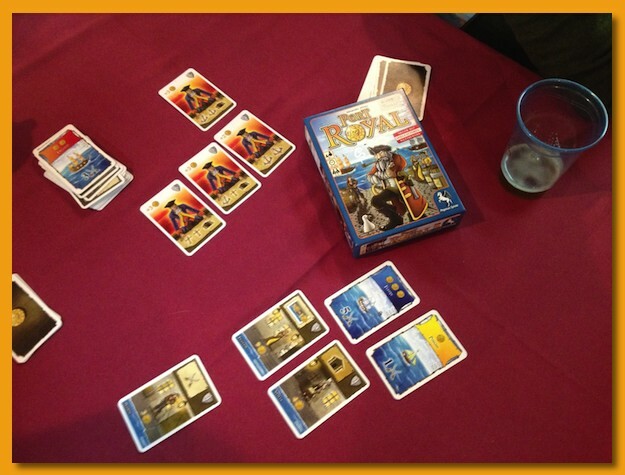 In addition to the ravens flight, players can play cards to another area of the table (the Magic Way) depicting two valid terrain types (or the Odin card) and at the end of the race (triggered by the first player to advance their raven to the end of the track) players earn points for having played the most cards to the Magic Way and for the distance (in terrain cards) between the two ravens. 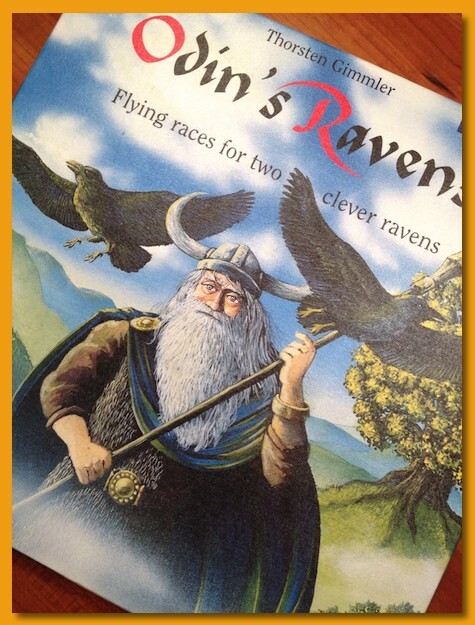 Odin’s Ravens is a great game for us. 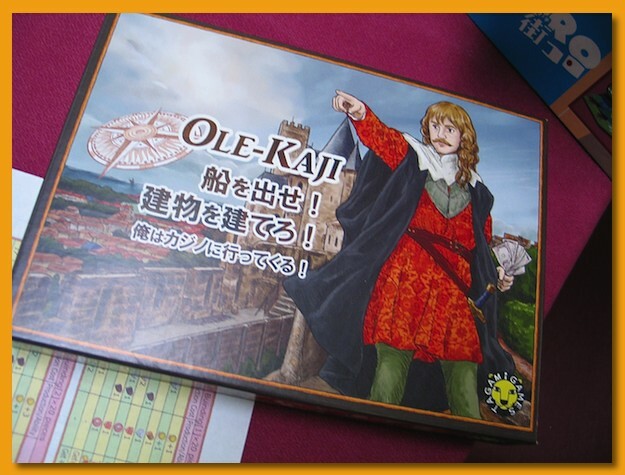 It’s small, packaged in the standard two-player Kosmos square/flat box, light, and easy packs for road trips. And most of all, it packs a lot of game in just a few cards. If you get a chance, try to pick up a copy or at least play it a few times. You’ll not regret it. 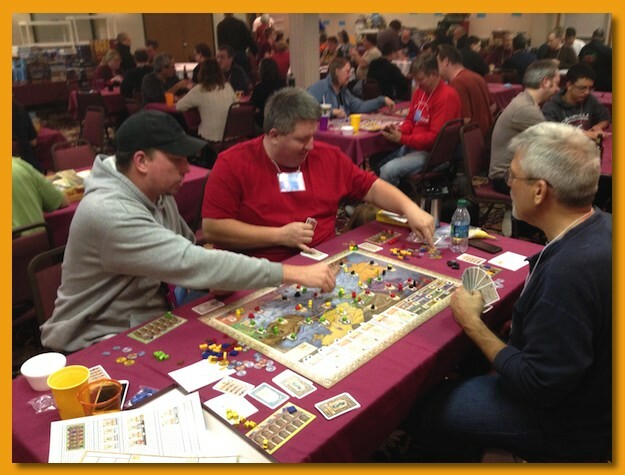 Lisa and I meet up once a year with a friend and her son at the Columbus Area Boardgaming Society’s After Turkey Data gaming festivities. This year we arrived around 10am and played straight through until about 9:30pm breaking only for a quick lunch and a light dinner from one of the food trucks that sat outside the gaming area. It’s normally a well-attended celebration, 125-150 gamers playing shoulder to shoulder. This year, however, there was a noticeably smaller number of gamers. CABS has been going through some transitional changes to their organizational structure, increased yearly fees, etc. that I suspect are contributing factors. However, it’s most likely an over-simplification to attribute the drop to any one specific cause. 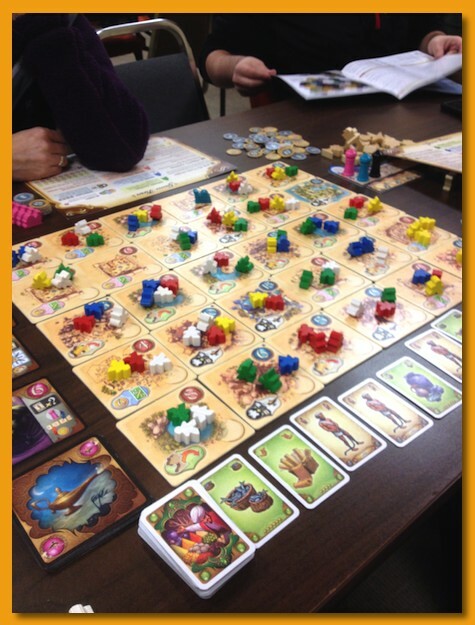 This was Lisa’s first play of Istanbul and she liked it. 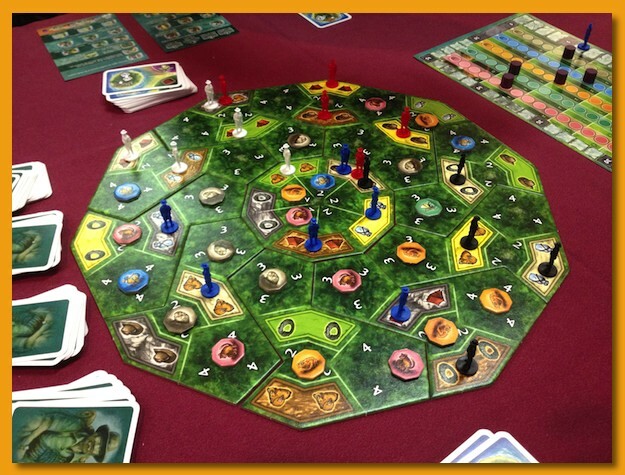 Our friend really liked it commenting that there felt like many way to earn points (gems), there was always a Plan B or Plan C, and that it played so fast it always felt like it was your turn. All good points you want in a game! We got the whole group together and played Viva Java: The Coffee Game for 6 but it felt like there we’re enough blend tiles in the box. The game felt much shorter than what it had felt like in the past but maybe I’m just getting used to how to play it without such a long ramp up time for explanation. 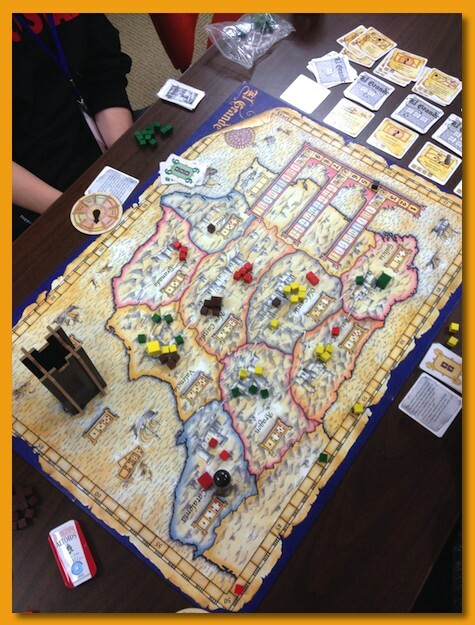 We finished the night off with a classic, El Grande. 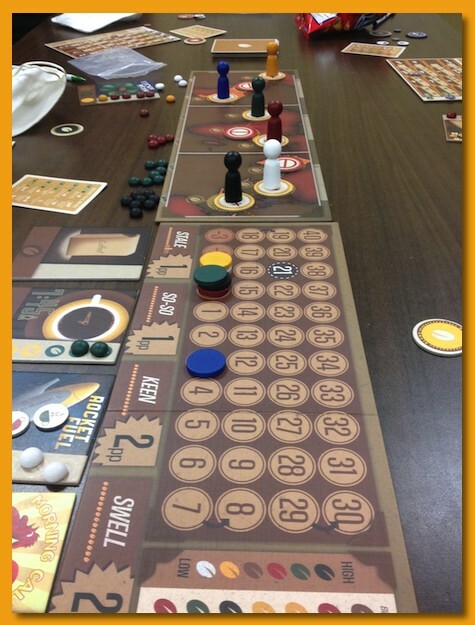 We started with five for the rules explanation but we lost one before we could start but it’s still good with four. I think it ran a little long as the AP started kicking in near the end. All in all, it’s a really good game to return to once in a while. I’ve already posted about my experience as a lone attendee but I figured I’d throw in a post with some images. The registration line wrapped around three times and then outside the building. Fun little shoot-em-up western. Cute boxcars do add something to it. Die Macher for noobs teaching moment. It’s not my kind of game but I did have fun playing with the people I was playing with. 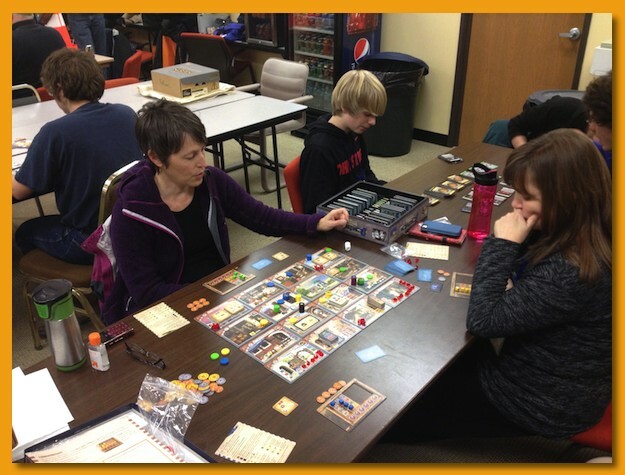 Three simultaneous tables of Die Macher…now that’s something! The last three minutes of the flea market. Chaos! Just a wee bit of the game library. My favorite game of the con. 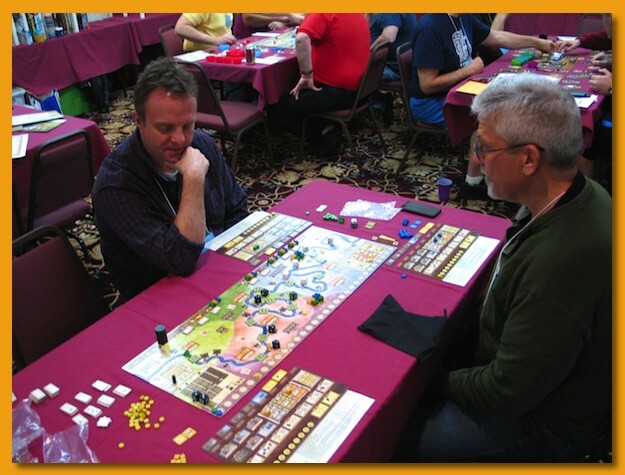 The designer, Peter Hawes taught us the game and sat beside me the whole game. We had a great chat about the design and different decisions where made during the process. Very enjoyable game! I traveled very lightly checking no bags and bringing an extra messenger back to carry back the prize table games. I had just enough clothes without feeling creepy 🙂 It’s probably a good idea I was traveling light because that flea market was oh so tempting! 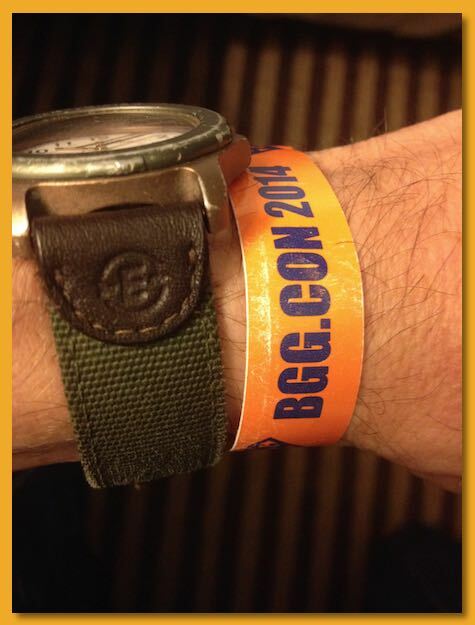 BGG.CON 2014 is done and gone but the afterglow is still there. I’m going to approach this post differently than I would for most of my posts and not make this post a mass of images. 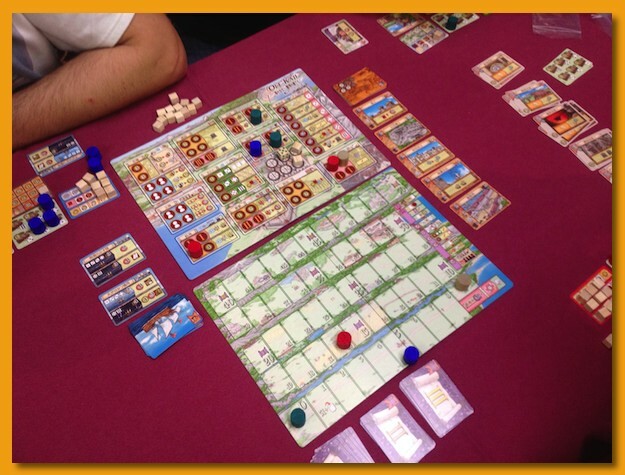 Most blog entries you’ll read will focus on the great new games they played, the hits and the misses. I played a lot of great stuff, and yes there were hits and misses but this post is going to focus on the experience as a first-timer and the experience of attending by myself. No surprises, but I’m not an extrovert and find it difficult to mingle, small talk is painful, and I’m not a “personality”. Traveling 1000 miles to Dallas to game with strangers for four solid days is way outside my comfort zone. The cost alone of the plane ticket, the hotel room, and my time off from work was massive. I knew that going in, of course, but for years I’ve wanted to attend the convention and see what the fuss was all about. 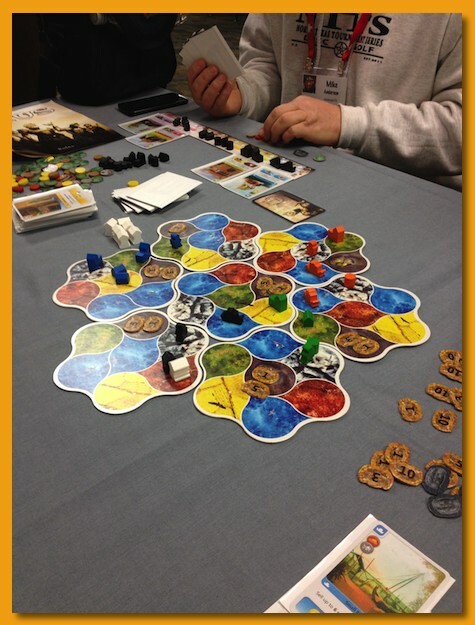 Great Lakes Games is three days of gaming and I was really looking forward to a fourth day. 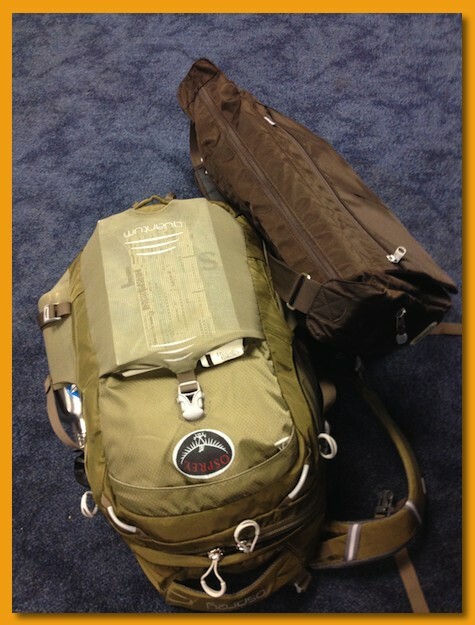 Knowing what I pack into those three days of GLG I was almost bursting at the seams to get there! I’m certainly glad I did attend and hope to get back, maybe even next year. I did find it a rewarding and enriching experience. However, I do want to capture my thoughts about what made the convention difficult for me and so if you’re interested in that, then keep reading. Otherwise, thanks for getting this far! My yearly After Turkey Day posts are coming up soon as well as Christmas gaming and then my yearly Cabin Con with my gaming group. For those posts, I’ll return to the regularly scheduled program. The plane flight from Columbus is an easy two hour trip, straight into DFW. To minimize cost I didn’t check any bags and only took enough clothes for one change of pants and a clean shirt (and other unmentionables) each day. All that and toiletries fit easily in a small day pack. I also brought an over-the-shoulder messenger-style bag for the trip back because I knew I’d have a couple of “give away” games handed out during registration. American lands at the C-concourse of DFW and luckily when you exit the terminal, you can easily cross a couple of lanes of passenger pick-up traffic, walk through a parking garage, over an elevated walkway and then down into the Hyatt’s rear parking lot. Within 10 minutes of exiting the plane I was waiting to check into my room. 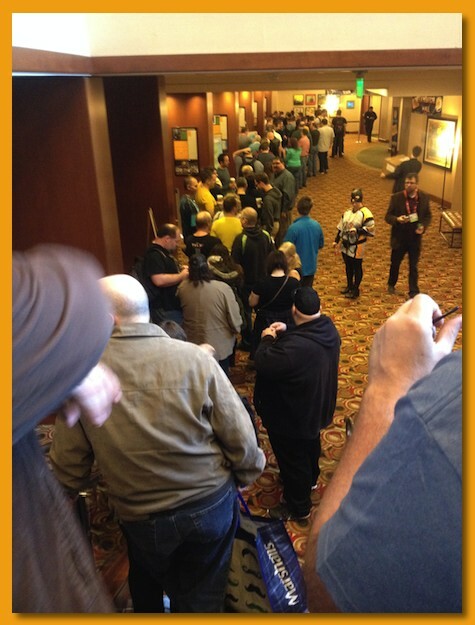 The BGG.CON registration line was forming quickly and since my room wasn’t ready yet (it was only 9:30am) I left my bags with the concierge and got in the line just before it exited the building. It took over an hour and a half in line to get my badge, pick my two games, and get back to the concierge to pick up my bags. I’d recommend just waiting until the first rush of registrations gets through unless you’re there very early or with others and can have some “in-line” fun. The people around me were mostly heads-down on their phones and didn’t really appear to want to talk about anything. I tried to engage them a few times but didn’t have any success beyond some rolled eyes and a grunt or two. A few clumps of people in front of me appeared to be having some fun but my pocket of people just kept to themselves. 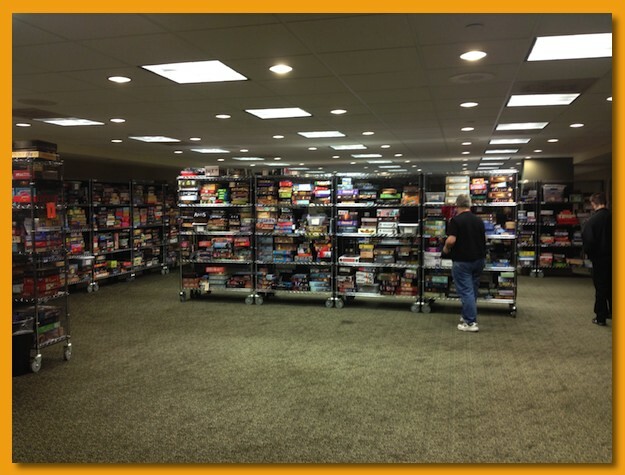 I did have my first face to face meet ups with some BGG “e-friends” while waiting in line and that was very nice and I looked forward to meeting up after I got through the line and playing some games. While waiting in line, the hotel left a message on my phone that my room was ready so I got my keycard and took my bags up and got settled in there. The elevators were a buzz of gamers going up and down and the conventional hall was hopping. I started with the Hot Games rooms and within seconds got into a game with five strangers in a light western themed game and had some fun. The group was a bit serious for the game but not knowing anybody I’m sure they probably had the same feeling about me. That game broke up in less than an hour so I went looking for another. I found some e-friends from the line but they were in the middle of a much longer game so I started trolling the room and it was so packed there was no way I was getting in on anything at the moment. So I headed into the exhibit hall and made the rounds there but that was quick. Not having any bag space I couldn’t really shop and I wasn’t really there to buy anything anyway. I wanted to play some games! 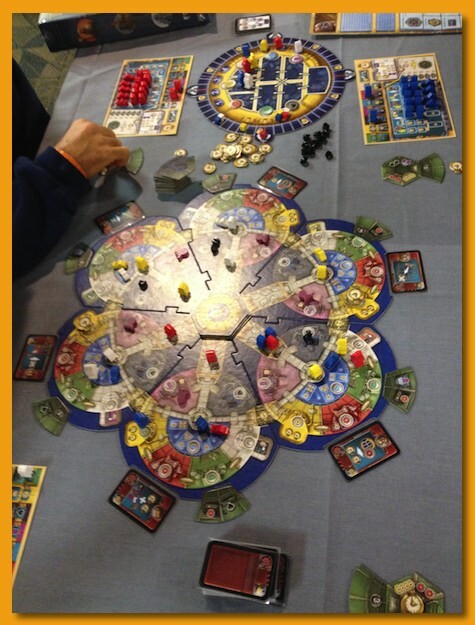 I spun a wheel at a Ravensburger booth and won a Castles of Burgundy expansion which was really great. I love the game *and* the extra player boards are flat and wouldn’t be a problem transporting them home. I then started walking around the big open gaming room and within a few minutes the first inklings began, a foreboding of what the rest of the convention was going to be like. 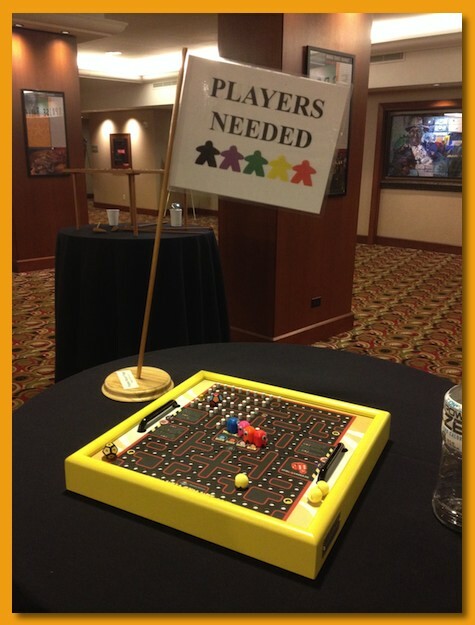 I didn’t know anyone and there were only two or three “Players Wanted” signs out. There were hundreds of people playing games, lots of laughing, smiling, and then me walking around for 30 minutes making attempts to get in on games that looked interesting or that I already knew. I did manage to sit in on some games but some people I could tell were reluctant to add me. After a few “I guess so” responses to my request to play and even an eye roll, I got a bit gun shy. I didn’t want to be “that guy” that sits at a table by himself for over an hour with “Teacher Wanted” and “Players Wanted” signs while surfing the web on his phone. In the middle of one of my games I watched “that guy” get up, pick up the signs, and walk out of the hall. 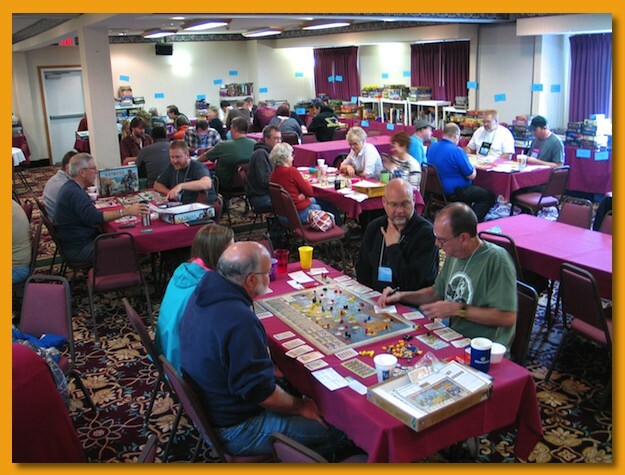 Unlike GLG where groups tend to stick together for a few games, groups of strangers at BGG.CON seemed to quickly break apart throwing me back into trolling mode walking by the same tables of people on their second or third game watching me go past for the third or fourth time in 15 minutes. When it started to feel a bit creepy, I’d head to the Hot Games room to see if I could get in line or something to try a new game. Many of the Hot Games didn’t appear to be “my thing” so I was relatively particular about what I wanted to wait for and after sitting and watching a game for 15 or 20 minutes it starts to get creepy as well. 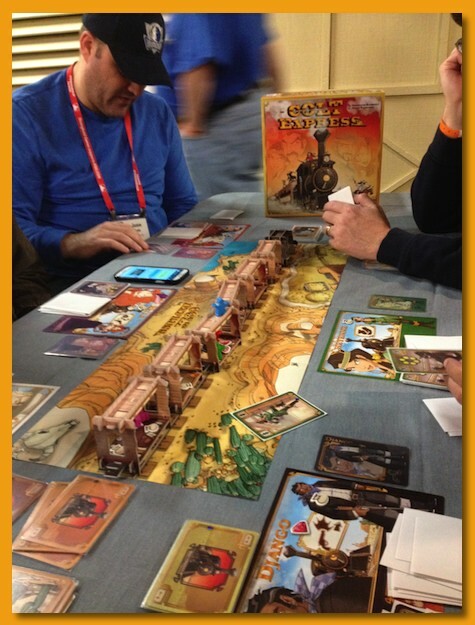 I did get lucky a few times and was able to sit in on pickup games for new stuff that I really wanted to try but on one occasion I had a thumping headache the size of Montana that I couldn’t process the way the mechanics fit together and played very poorly. I know I’ll like the game (that’s a good thing since I’d already Kickstarted it!) but it felt disappointing that that experience had to happen when I finally got to do something I’d paid good money for. 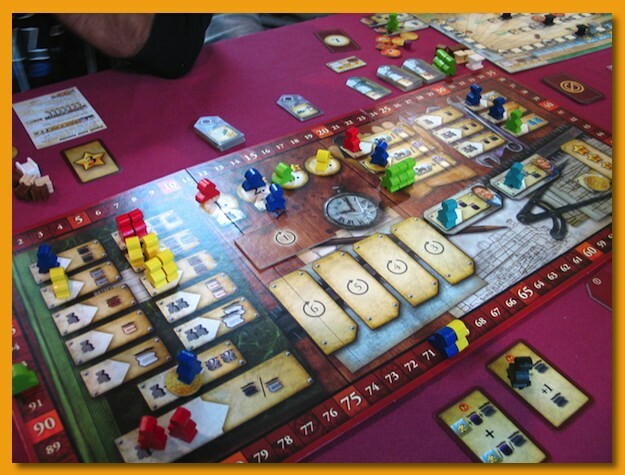 I signed up to play an epic game of Die Macher on Friday morning and was really looking forward to that but an hour into that game it really bogged down and I realized that the game really wasn’t for me. Thankfully I was playing the game with some fun people but I was glad we declared a hard stop after 5 hours of play especially when we’d only made it through three of the seven elections. 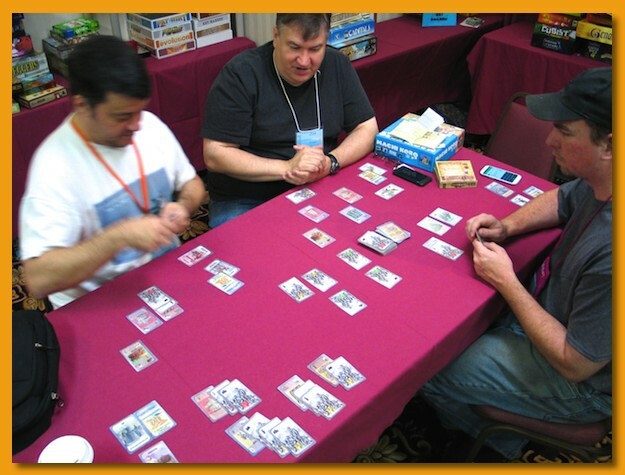 After that game, I decided to take a different approach to my attempts at finding playing groups and began seeking out people playing two-player games in the open area. I had much better success at that playing games with young couples, old couples, and even a couple in their forties that had brought an in-law with them. They had been trying to learn La Isla (a new Feld game) and since I’d played it before I helped them out and sat with them through the game. 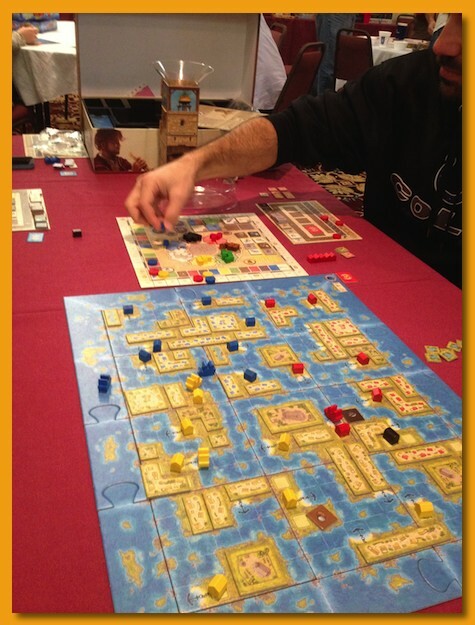 On another occasion I taught an elderly woman and her husband how to play Amerigo. I enjoy playing games with strangers but I really get enjoyment out of playing games with people I know really well. Going by yourself takes a lot of effort and energy and I felt drained at the end of each day. 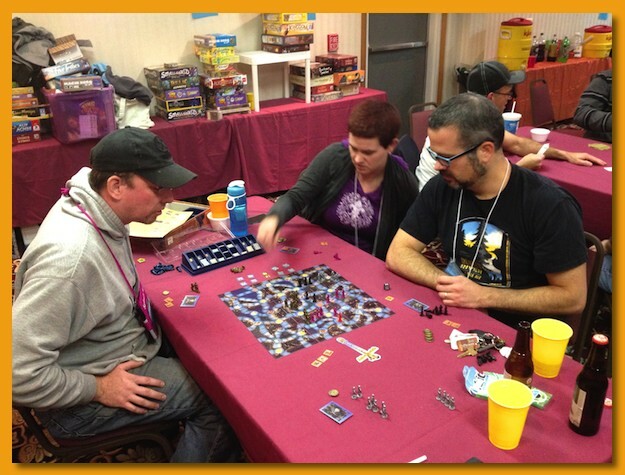 My rate of gaming was abysmal compared to Great Lakes Games. That’s not to say that it was a bad experience but it wasn’t what I was expecting. The crowds are great, the space limited, and it’s loud…very loud. I noticed when I’d walk into the hallways that they were always packed with people coming and going and there were always lots of single people sitting around looking at their phones. I wondered if they were also in the same predicament as I was. The Players Needed flags work, I’m proof of that but I wonder if there might be a more efficient way to get into games for those alone or those that want more than just two. 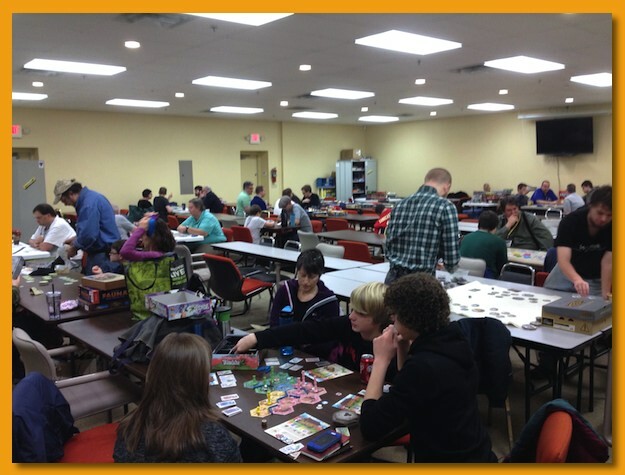 Might it work to have a small area in the open gaming room where singles can gather and people with games looking for others could come to get them for pick up games. And might that approach be a way for singles looking for games to meet in a non-confrontational way. You know, hey, there are three of us here waiting to get into a game and we’ve all got Eurogamer ribbons on our badge, let’s go play something rather than waiting for somebody else! I’d like to think I’ll find a way to go back next year but I’m not sure I would do it again without a close friend or two. I’d really like to share the experience with someone that I know and can discuss the experience with over dinner or in the room as we stagger back at 1am. I didn’t have that experience this year. 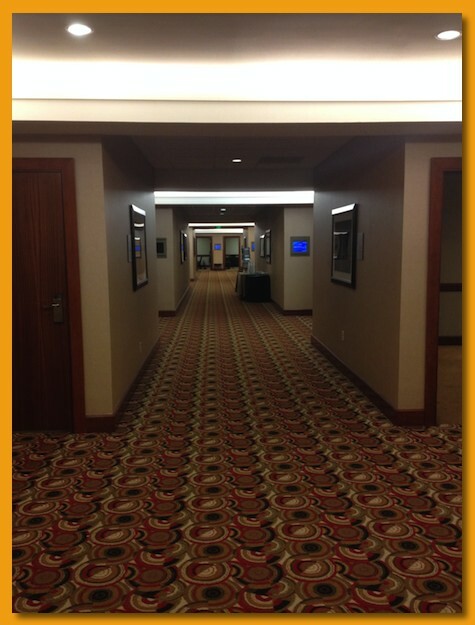 I was worn out, exhausted by trolling the gaming rooms, and back in my hotel room by 10pm every night. That’s not to say that I’m not part of the problem. I recognize that but I can’t change that very easily. I was already feeling the pressure of being “on” and outside my element for the entire day. 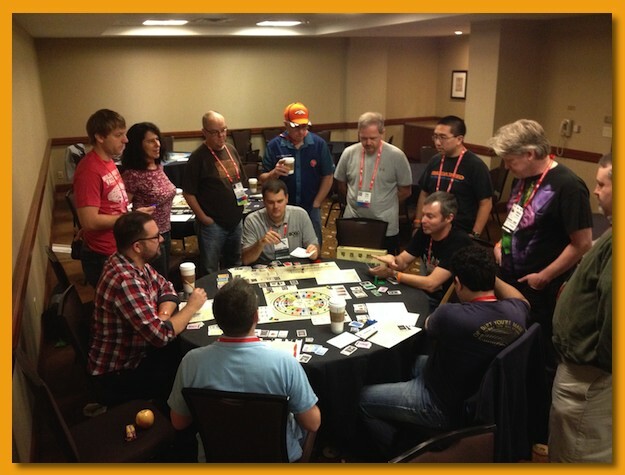 Was BGG.CON fun? Sure, a lot. I see the potential and would have a completely different experience with close gaming friends at hand. I had a blast meeting people for the first time face to face but those are fleeting and not really relationships you can capitalize on the first time without feeling like the equivalent of a gaming remora, feeding off the fun-shaped detritis of other gamers. I really liked working in the library and would sign up for that task every morning for an hour or two. It really was fun to talk to people as they came through the library, recognizing my avatar or my name from this website. Maybe going back would be a better experience because I could begin to capitalize on those relationships I started this year. That’s how it all works right? One year at a time? 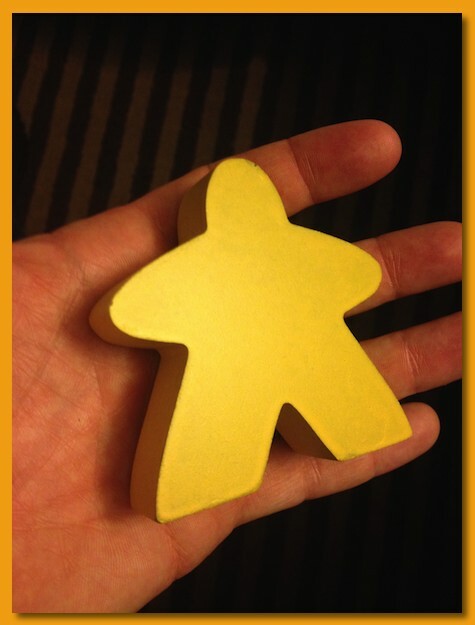 Tomorrow, at 6:30am, I’ll be boarding a plane headed for Dallas, TX to attend BGG.CON. I’m really looking forward to it but given that it’s my first time, I do have some apprehension and anxiousness. 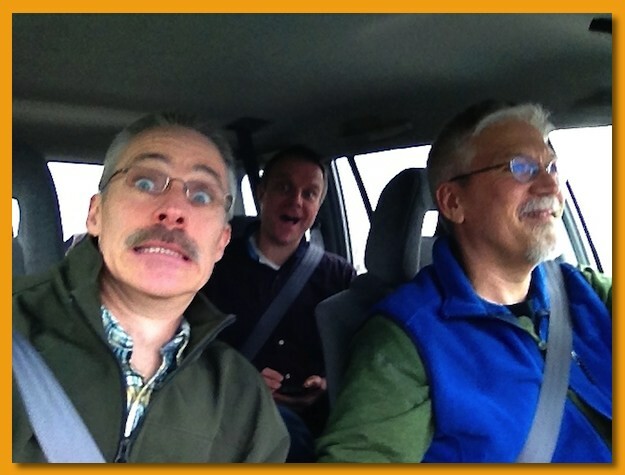 I’m not a natural mingler® and since I’m going alone I’m definitely outside my comfort zone. 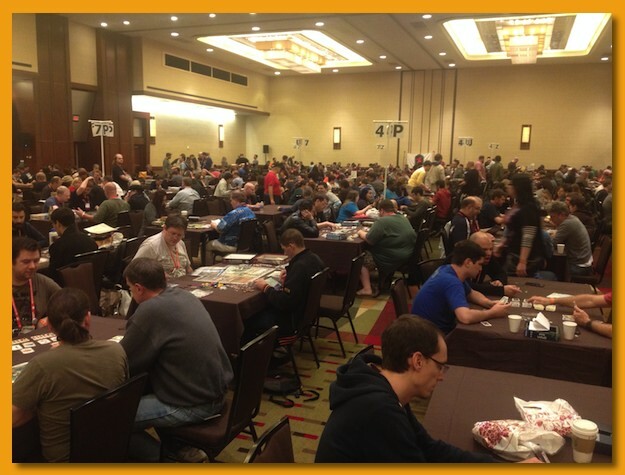 BGG.CON hosts roughly 2300 gamers and focuses primarily on open gaming. 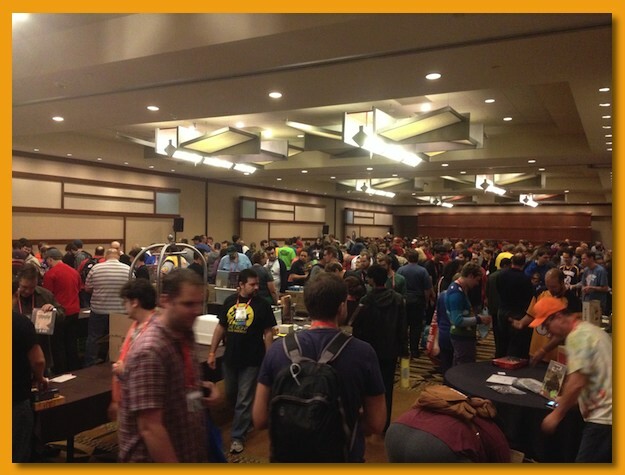 They’ve got a game library hosting over 3000 games available on-site for attendees to checkout and play. They also dedicate a special “hot games” area for new “Essen” games and will have people available to teach them if you’re into the “cult of the new” (YES!). 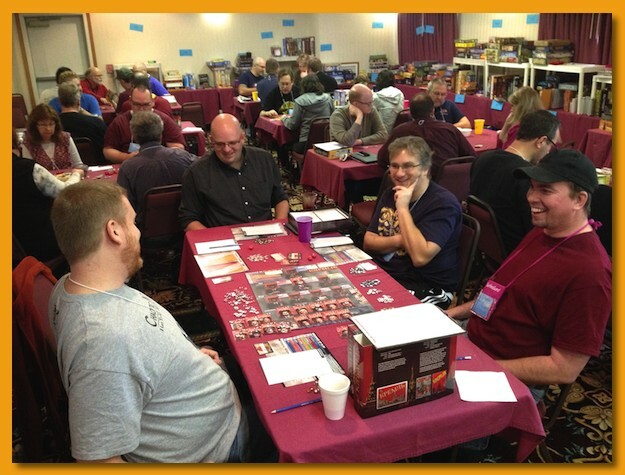 To date, my longest convention has been 3 days of solid gaming, morning, noon, and night and BGG.CON adds an entire extra day. I know I’m going to be exhausted physically and mentally but it will be nice to meet up face to face with people I’ve only interacted with online. To help with anxiety, I’ve signed up for the “first timer/orphan (attending by yourself)” meet-up Wednesday night but I’m sure my anxiety will melt away within minutes of entering the gaming area (fingers crossed). 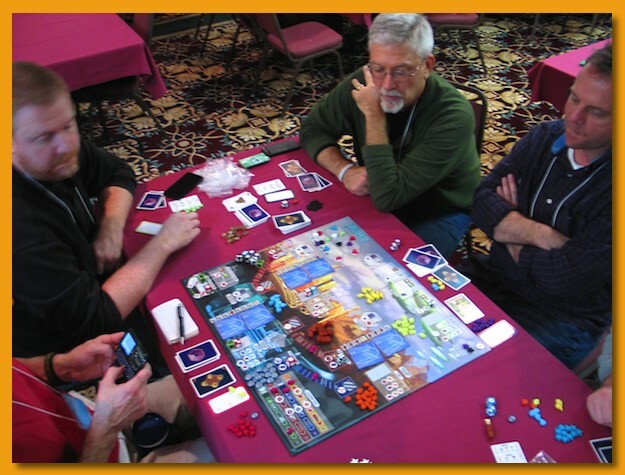 I’m also signed up to work in the game library Saturday morning and on Friday morning, an “epic” game of Die Macher for those new to the game. 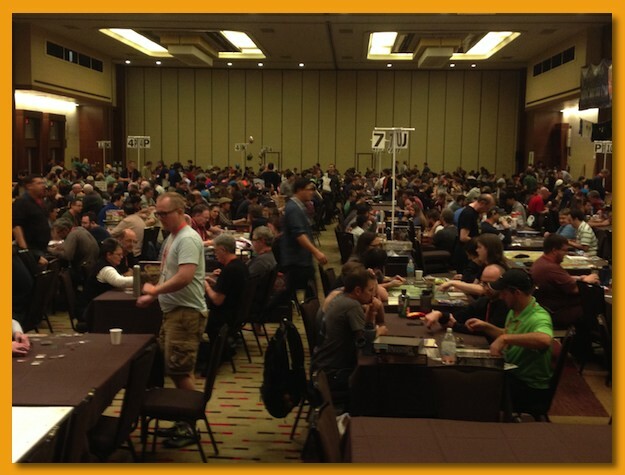 Another Great Lakes Games has come and gone. As usual, Dave Vander Ark, his wife, and many others really put on a great convention. I got to play a lot of great games and catch up with people I only get to see once a year. This year was an extra special treat since another member of my game group got invited bringing the total to four. Only three of us could make it this year but it was fun to pile all our stuff into a single car and make the 3 hour trip. I remember my first GLG. I went alone forcing myself to mingle with gamers I didn’t know. That was definitely outside my comfort zone but in the end, it was the funnest thing I’d ever done like that. It was exciting to watch a third friend from my group as he experienced it for the first time. It’s hard to put into words how rewarding and enriching I find the GLG experience. I wouldn’t miss it for the world. GLG features a prize table as an added perk for attending. You’re encouraged to participate and bring an in-shrink copy of a “good” game; it’s left up to you to decide what that means. 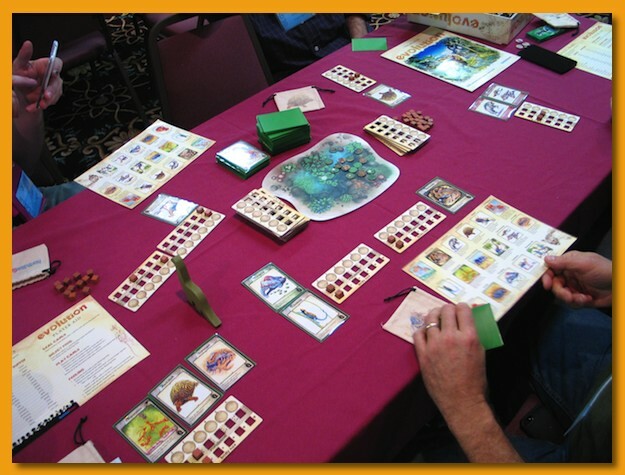 Many people bring one good game and several used games for the table. 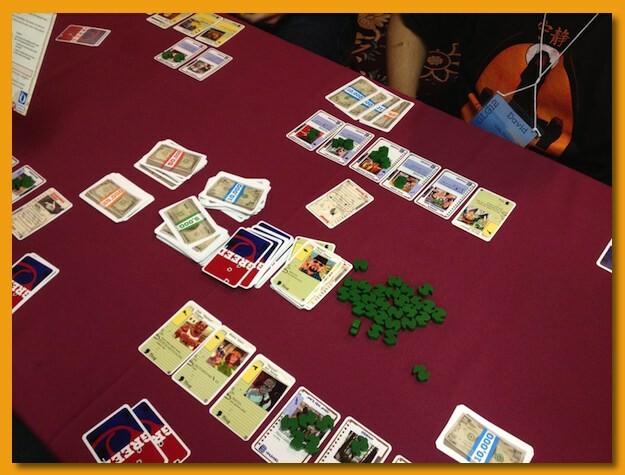 Better games tend to go early in the rounds which means you’ll get a chance at picking from the table earlier. I brought multiple games this year and walked away with a copy of L’Aeropostale, Odin’s Ravens, and a copy of Munchkin to give to my son, Noah (he plays with his friends and they have a blast with it). 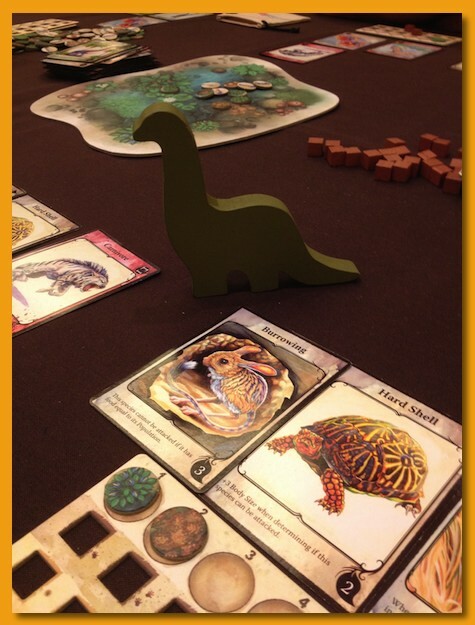 I’m not fond of mixing reviews with bulk convention information so the rest of this post is mostly just a stream of pictures from the convention. I’m already planning for next year!